Just north of Oxford Street, Fitzrovia is fast becoming the restaurant capital of London. However, quite problematically, besides eating and drinking establishments, the area has little else to offer in terms of leisure, and as a result there’s an incredible amount of competition between local restaurateurs. Fitzrovia is home to the likes of the ever-brilliant Dabbous, The Ninth, and the latest opening of Bao, which has already garnered Kardashian-level social media hysteria, not unlike its big sister restaurant in Soho. The latest addition to the neighbourhood, Calcutta Street, is the first permanent restaurant from Shrimoyee Chakraborty, following a string of successful pop-ups and her incredibly popular blog – Shrimoyee’s Scrapbook. 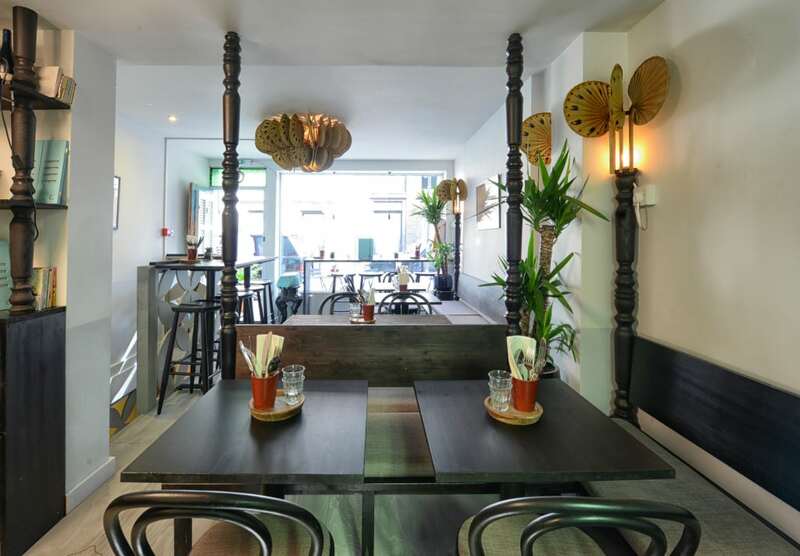 Set on a quieter stretch of Tottenham Street, the restaurant strives to take guests on a culinary journey through the chef’s home city, from Bengali street food staples, through to her own interpretation of classic dishes heavily inspired by home cooking and time withstanding family recipes. Inside, the restaurant is generally quite modern, with most of the furniture sourced from Calcutta. A contemporary chandelier fashioned from hand fans hangs from the ceiling, while a nod to traditional Bengali shutters is also prominent, from the front door through to the wooden menus especially crafted to resemble window shutters. Unsurprisingly, the service is particularly hospitable, too, all without being intrusive. During our lunchtime visit, Shrimoyee was on hand to greet diners, emanating a balance of charm and modest confidence that’s seldom seen within new restaurateurs. As for the food, everything served by the kitchen is 100 per cent Bengali and is mostly traditional. Focusing on sharing-sized smaller dishes, the main menu is split into two main sections: ‘Street Food from Golpark’, which acts as small pre-dinner bites, plus a main section of dishes inspired by Shrimoyee’s family kitchen on Gariahat Road. A selection of breads, rice, sides, and some smaller dishes are also available. To start, a Chicken Reshmi Kebab showcased chunks of chicken thigh that had been marinated in mint and coriander, threaded onto wooden skewers and grilled – a simple, yet flavoursome dish. Elsewhere, Beguni, featuring sliced aubergine dredged in chickpea flour and deep fried had a texture far more palatable than so many examples of this dish. Quite brilliantly, the kitchen had also managed to keep the focus on the aubergine, preventing the overpowering flavour of cooking oil from dominating the entire dish. Next, Macher Paturi one of Shrimoyee’s signature dishes featured a whole sea bass prettily presented under a wrap of the parchment-like banana leaves that it had been steamed in. Although the fish had been cooked with care, the bottom fillet had alas managed to become limp and sodden. This was partially our own fault, having not managed to gluttonously devour the whole fish within two or three minutes, but the steaming process is the main culprit. While the food on offer at Calcutta Street could never be accused of blandness, the strong flavours of mustard and coconut for the coating did also manage to somewhat overpower the delicate flavour of sea bass. 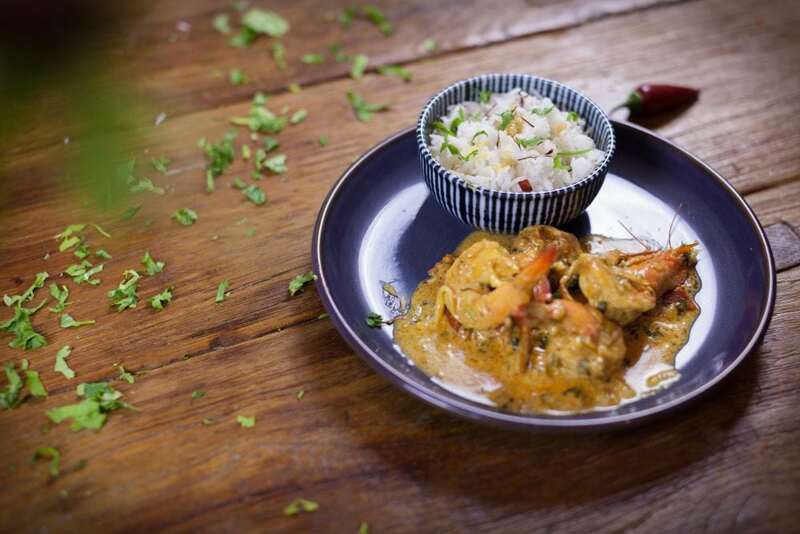 Prawn Malai Kari was far better, with plump tiger prawns bathing in a wholesome sauce that had a coconut base and delivered a warming hum of red chilli. It’s the sort of dish that I could happily get lost in: with such an incredibly depth of harmonising flavour, it’s an ideal pick-me-up, especially with the cold British winter now well on its way. What’s more, the sweetness of coconut wasn’t overly prominent and insipid, and the saltiness of the prawns added a type of natural seasoning to the truly marvellous dish. Before sampling the ‘Mishti Aam Doi’, hot yoghurt was not amongst my favourite dishes, and after tasting still remains that way. Banana Malpua was far more exciting, however, with classic Bengali hotcakes that had been soaked in sugar syrup and joined by slices of ripe banana. Although not all of the dishes manage to deliver, there’s something endearing about the concept of replicating a Bengali home dining experience within a restaurant setting. What’s more, the majority of the traditional dishes on offer are very difficult, if not impossible, to find in other London restaurants, thus making a visit to Calcutta Street essential for enthusiasts of Bengali cuisine. Calcutta Street can be found at 29 Tottenham Street, London, W1T 1RU.